Urban.com.au recently highlighted the approval of DealCorp's new $100 million project - Glenarm Square - which will transform the forecourt of the newly revamped Gardiner Station in Glen Iris into a thriving new community space featuring a diverse range of planting and tree canopies. Today's piece focuses on the public realm aspects of the development, with the 2,000 sqm plaza supported by an activated ground plane of commercial businesses. Theses retail and commercial tenancies will occupy 1,000 sqm spread across two levels comprising a café, a deli/grocer, and a provedore. 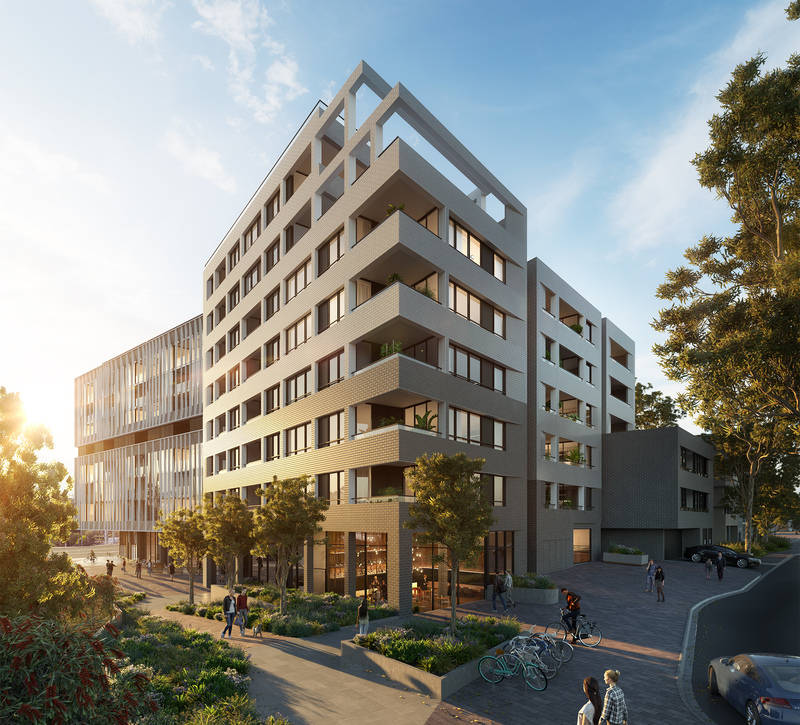 The new precinct will service the residents of the 120 apartments within the seven-storey residential building, and continues the growing trend of new developments based around train stations and rail environments. These new transit and community hubs assist in activating previously underutilised spaces and creating destinations along Melbourne's rail network. Upon completion in 2021, Glenarm Square will provide residents and visitors to Glen Iris with a new village square, with formal and informal seating dispersed throughout the precinct, creating spaces which encourage social interaction and congregation. The project has been designed by Plus Architecture and Hecker Gutherie, in combination with Urbis and DealCorp. Planning and design consultancy Urbis has been involved in the project for the past four years, working closely with the Level Crossing Removal Authority, John Holland, KBR and Grimshaw. Urbis provided planning, urban design and landscape architectural services throughout the design and delivery process. Additionally, Urbis was responsible for assessing the uplift potential of surplus land created along the rail corridor via the provision of valuation and feasibility analysis. On Glenarm Square, Urbis sought to create a permeable civic space where residents and travellers feel safe in a thriving and engaging communal space. According to DealCorp, the amenity and growth of Glen Iris was a significant consideration in the planning of the precinct. The Residences at Glenarm Square adopts a dual façade approach which relates and responds to adjacent streetscape conditions and materiality with vertical articulations referencing the shop fronts along Burke Road. Residents within the residential building will have access to a gym, 15m indoor pool, communal lounge and business centre for residents, and a communal kitchen and dining area that has been created in collaboration with renowned Melbourne chef Shane Delia. DealCorp are preparing to start construction on Glenarm Square in 2019. We have designed Glenarm Square to bring the station to life, creating an exciting new destination and activating it from morning until night instead of confining the activity to peak travel times. Glen Iris is one of most in-demand suburbs in Melbourne’s inner east. Glenarm Square will regenerate and repurpose the currently unused land adjacent to Gardiner Station and create much-needed amenity for the community. The key was finding the balance. Creating active edges with visibility from Burke Road through to Glenarm Road, and defining boundaries which are also permeable and visually appealing to draw people into the centre of the square,” said Haack. We achieved this through our use of materials such as perforated screening and designing an elevated concourse that integrates with the station.